Today am with a tasty yummy drink with pistachios and milk. 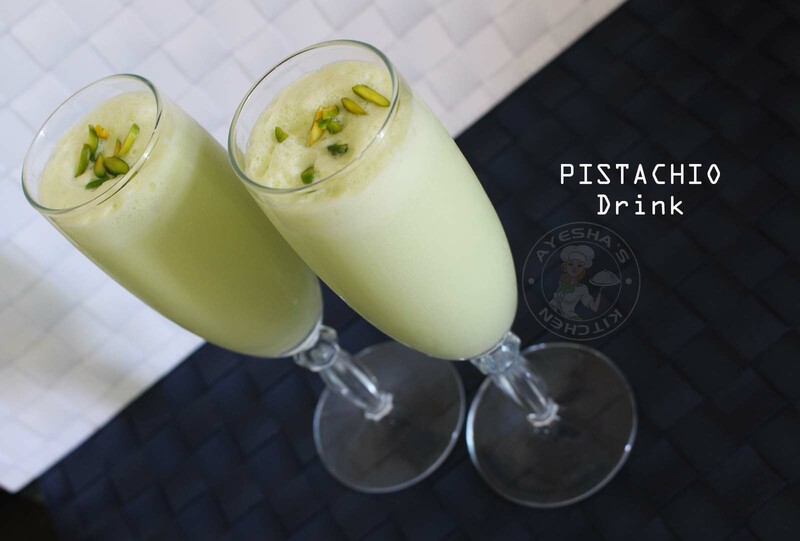 While considering the wonderful benefits of pistachios, this drink is perfect for iftar. A drink which is so simple to make yet delicious and healthy. Especially during Ramadan, we browse for some simple healthy drink to boost us up during iftar time. When ramadan falls in summer, for sure such drinks are very helpful. As pistachios helps in smooth digestion of food, we prefer this drink during ramadan. The combination of pistachios, ice cream and milk makes this drink more delicious in each sip. Kids and adults will equally love this drink for sure ask for more. In my native place, Kerala this pista drink is often served in special occasions as a welcome drink for marriages, birthday parties, like so. 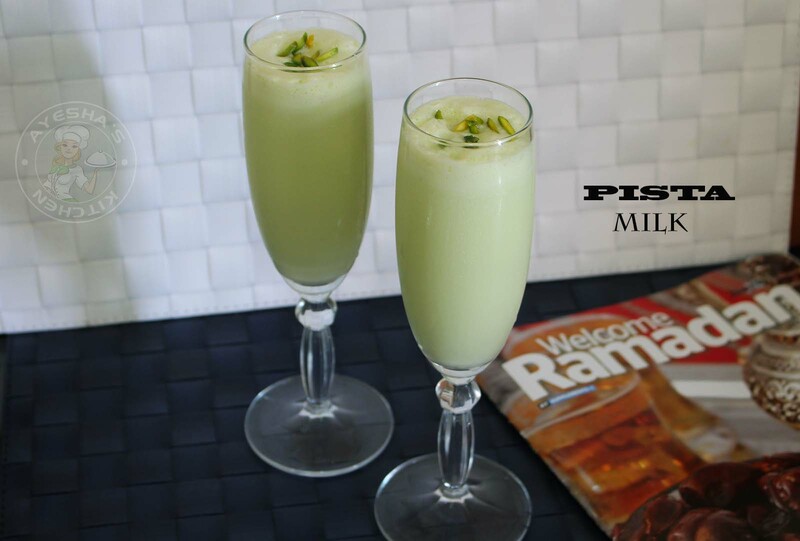 Though this looks similar in taste and texture to the fresh pistachio drink, it is made with pista essence only instead of fresh soaked pistachios. A few drops of this pista essence is just enough to make that pista drink which is served for a crowd. But i must say, it is not at all a healthy drink. Lets have a ride through health benefits of pistachios. Pistachios helps in weight loss and so it is the first choice for those who are dieting. As pistachios are good source of dietary fiber, it helps in smooth digestion of food. Like so, the vitamin, minerals and proteins found in pistachios are very good for health. 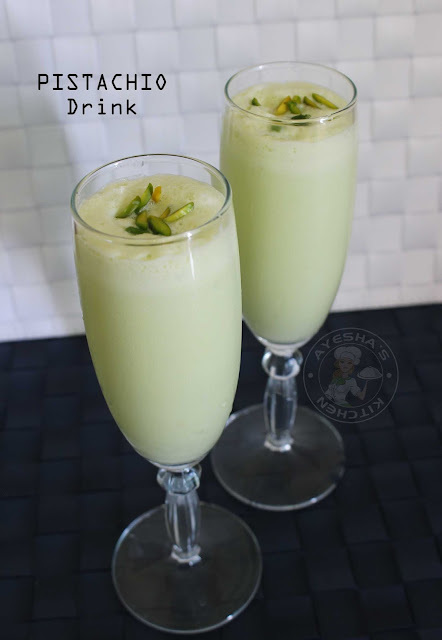 So lets see how to make healthy pistachio drink / pistachio milk /pistachio flavoring /pistachio ice cream drink / party drinks /easy drink recipes /party drink ideas / easy party drinks /drinks for a party /summer drink ideas /ramadan recipes for iftar . Soak sliced or blanched unsalted pistachios in quarter cup of water for 20 minutes. When done, drain the water and blend the pistachios along with quarter cup of milk until a fine smooth paste. Then add, one cup of chilled milk to it along with sugar and ice cream. Again blend well until smooth. Pour it to the serving glasses and top it with some sliced pistachios. Healthy tasty pistachio milk drink is ready. Serve immediately or keep refrigerated for serving later.